Last year, the Mazda3 won the Auto Journalists Association of Canada’s (AJAC) Car of the Year Award for both the Best Under $21K and Best Over $21K Small Car categories. What bowled over many AJAC members, including your author, was how enjoyable these cars were to drive, period—or actually comma—because they were still very affordable. I loved both the hatchback and sedan. However, I’m also a MINI owner and can honestly say that no car feels quite as good to me as a MINI, even Mazda’s crazy-fun MX-5. Nonetheless, I never would have called MINI a budget brand. Then 2014 happened. BMW, the makers of MINI, have dropped their prices and the gloves, and come out swinging. No, the manufacturers didn’t stint on quality. And no, you don’t need to fork out for expensive extra packages to render this ride roadworthy and envy provoking. It starts affordably and stays affordable. Dare we call it ‘cheap’ on gas? A standard feature even in this entry-level trim is the automatic start/stop technology. It pauses the engine at traffic lights and snarled traffic, then revives it instantly when you depress the clutch or accelerator. So every millilitre can count. There’s also a new turbo engine that is insanely efficient. Twin scroll tech in a single turbo creates the oomph of twin turbo without the added weight. It’s just three cylinders, 1.5L, but cracks the whip in Sport mode, wringing every last hoof out of its 134 ponies. It also has an Eco and Mid mode, each one providing a unique driving experience — pampering drivers regardless off their income, a la Mazda. Total fuel efficiency? It ratings are 6.8L/100km in the city, the same as the Mazda3, but 4.6 on the highly, .2L/100km better. And did we mention it’s fun? You won’t get near the above numbers if you live in Sport mode but that’s the same with any vehicle. 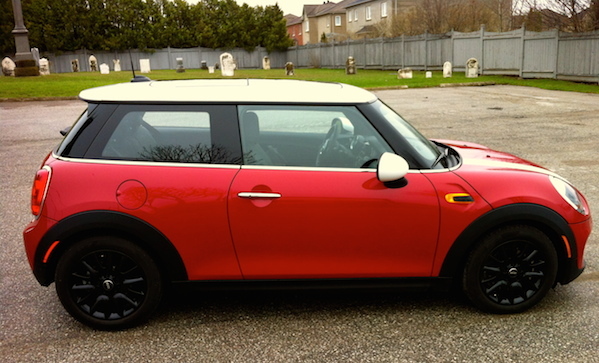 The MINI is simply more tempting to play in than most cars. The new one is slightly bigger than the 2013 but also lighter, delivering even more of that uniquely road-vacuuming MINI experience. Find some hilly corners and you’ll see. Watch for it at this year’s AJAC Awards in October: $20,900 is under $21K.